Tempers flared at a stall in central Hastings on Saturday January 26, where volunteers from the European Movement, which supports remaining in the EU, had set up to gather local Brexit opinions. Just a few steps away was a similar stall for the Brexit camp, but with fewer people around it. 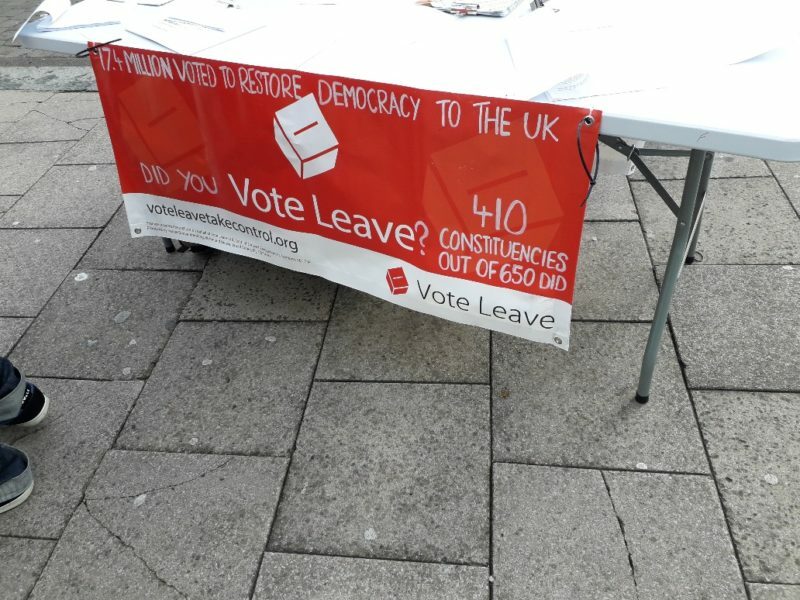 An altercation happened at the Remain stall where a leaver ranted at a remainer putting a sticker on the board, accusing her of not believing in democracy, but the incident did not ecalate further. The stall had a leaflet with a quote from Winston Churchill in 1946. Graham Bishop, vice-chair of the European Movement and an experienced European integrationist read through Churchill’s many quotes and speeches to oppose the rumour that latter was really a Eurosceptic. It said the goal was: “To recreate the European Family, or as much as we can, and provide it with a structure under which it can dwell in peace, in safety and in freedom.” Churchill was one of the first Honorary Presidents of the European Movement. The European Movement wants a United States of Europe, although they are too shy to ask for people’s opinion on the EU Army, Finance Ministry, Police (Military and Civil) as well as the breaking up of the UK in to “Regions.” Calls for a “People’s vote” by organisations that want to overturn democracy is risible. Calls from an organisation so closely linked to the EU, which has consistently ignored all democratic votes it does not like, is obscene. The tone of this piece is in favour of those seeking to overthrow democracy. Why? Those who are against democracy should explain what they want in its stead. Trying to use democracy to destroy itself is a sad legacy of 20th century Germany – it must be rejected by all who hold freedom and democracy dear. Editor replies: You are fully entitled to your views, Timothy, but let me correct you on a couple of points: first, the full week’s work that is required to produce this paper every Friday is certainly not ‘playing’ at it and, second, you should not assume that ‘the folks at Rye News are so pro Remain’. Like everywhere else in the country, the Rye News team is split with both sides of the argument being represented. We have, in the past, been accused of being pro Brexit so the fact that you now take the opposite view would seem to suggest we have got it about right.